Natural Health News — As we head into allergy season, a simple supplement could make you feel less sneezy and wheezy. That’s because new research shows a probiotic combination might help reduce hay fever symptoms, if it’s taken during allergy season. Seasonal allergies can reduce sleep and productivity at work or school and can cause stress and embarrassment. In addition, current allergy medications have unwanted potential side effects, including dry mouth and drowsiness; thus the need for alternatives. Previous studies have shown some probiotics can help to regulate the body’s immune response to allergies, but not all of the probiotics tested have demonstrated this benefit, University of Florida researchers say. » Previous studies have shown some probiotics can help to regulate the body’s immune response to allergies. However, not all types of probiotics have shown benefits. » In this placebo-controlled study a probiotic combination, sold under the brand name Kyo-Dophilus was shown to bring clinical improvements to seasonal allergy symptoms. » Kyo-Dophilus contains Lactobacillus gasseri KS-13, Bifidobacterium bifidum G9-1, and Bifidobacterium longum MM-2. Scientists think probiotics might work by increasing the human body’s percentage of regulatory T-cells, which in turn might increase tolerance to hay fever symptoms. There is evidence that the probiotic combination of lactobacilli and bifidobacteria, helps maintain digestive health and parts of the immune system. Acidophilus bacteria predominantly colonise the upper to lower part of the small intestine, while bifidum and longum colonise primarily the lower part of the small intestine to the large intestine. In this study, researchers looked at a branded supplement, Kyo-Dophilus which contains the strains Lactobacillus gasseri KS-13, Bifidobacterium bifidum G9-1, and Bifidobacterium longum MM-2. “Not all probiotics work for allergies. This one did,” said Jennifer Dennis, first author on the latest study. For their study the scientists randomly divided 173 healthy adults, who said they suffered seasonal allergies, into two groups. Some took the combination probiotic, and others took a placebo. Each week during the eight-week experiment, participants responded to an online survey to convey their discomfort level. The study was conducted at the height of spring allergy season. During the study the scientists also analysed DNA from participants’ stool samples to determine how their bacteria changed, because probiotics aim to deliver good bacteria to the human’s intestinal system. The DNA test also confirmed who was taking the probiotic, said Bobbi Langkamp-Henken, senior author of the study. Participants who took the probiotic reported improvements in quality of life, compared to those taking the placebo. For instance they suffered fewer allergy-related nose symptoms, which meant that they were less troubled during daily activities. 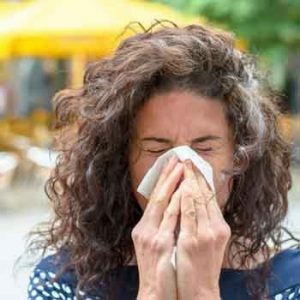 Although this study did not include severe allergy sufferers, it did show that those with milder seasonal allergies can see clinical benefit from taking the probiotics.